In 2010, Barolo witnessed something special. The wines combine the best qualities of other recent top years—purity, elegance, balance and complexity, plus the ability to age. It promises to be a benchmark vintage. Watch our video preview of the issue. German Riesling: A free chart offers an alphabetical list of all German Rieslings reviewed for the tasting report in this issue. 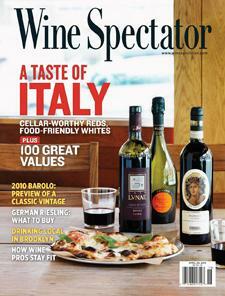 WineSpectator.com: More than 745 wines were reviewed for this report. A free alphabetical list is available. WineSpectator.com members can access complete reviews for all the wines tasted using the online Wine Ratings Search. WineSpectator.com: BONUS VIDEO Gaja's Italy: Angelo Gaja, who revitalized the Barbaresco appellation, and his daughter, Gaia, share the family's wines from Piedmont and Tuscany in this seminar. WineSpectator.com: Always on the hunt for a bargain? Browse our frequently updated lists of Top Values, high-scoring wines at great prices; Easy Finds, inexpensive, quality wines made in large quantities; and Wineries for Value, producers that have made the most values in their region. WineSpectator.com: More than 325 wines were reviewed for this report. A free alphabetical list is available. WineSpectator.com members can access complete reviews for all the wines tasted using the online Wine Ratings Search. WineSpectator.com: BONUS VIDEO Germany's Rare Rieslings: This seminar on four sought-after dessert wines, each representing the pinnacle of quality from its region, features winemakers from St.-Urbans-Hof, Bassermann-Jordan, Schloss Johannisberg and Gunderloch. WineSpectator.com: Members can reference our full archives of Mark Pendergrast's columns and other articles on coffee. WineSpectator.com: Build your cellar through smart bidding. Use our online Auction Price Database to track the performance of more than 10,000 collectible wines. Fabio Trabocchi's Halibut and Porcini Crema with Barbaresco - Fabio Trabocchi, Fiola, Washington, D.C.
2013 BORDEAUX BARREL TASTINGS Which wines should you buy as futures from yet another difficult vintage for Bordeaux? Rain made the harvest challenging for the dry reds, but Sauternes and Barsac may excel. Senior editor James Molesworth visits the region in March to taste barrel samples of the young wines. Members can read his on-the-scene blog posts for highlights from top châteaus. Plus, get his scores and tasting notes for hundreds of reds, dry whites and sweet wines. MIXED CASE Senior editor Alison Napjus joins our team of bloggers! Read their thoughts on current events and wine culture, tips on learning more about wine, conversations with notable people in the wine business, travel to wine regions, and more. LETTER FROM EUROPE Follow contributing editor Robert Camuto in his new twice-monthly blog as he travels through France, Italy and beyond, sharing the fascinating and inspiring stories of the people who make wine or influence wine culture. CHEFS' PERSONAL RECIPES What do chefs cook at home for family and friends? Contributing editor Laurie Woolever chats with big names and rising stars, who share their favorite home-style recipes and wines to match. FINAL FOUR TASTE-OFF We wouldn't bet big based on our findings, but our tournament bracket is a lot more fun than the average office pool! Wineries near each of the 2014 NCAA Final Four contenders take on our annual challenge to predict the championship winner. Bordeaux Stars: Prince Robert de Luxembourg, who oversees Châteaus Haut-Brion and La Mission Haut-Brion, speaks about his family's history and focus on making the best reds and dry whites. Luscious Sauternes: Château Guiraud winemaker Xavier Planty describes the making of Bordeaux's great sweet wines as he pours the 2009 Guiraud—Wine Spectator's No. 5 wine of 2012.